Mopping is the most tedious, messy and tiring household chores – which you cannot ignore to maintain your house clean and tidy. But things have changed since few years – with Modern Cleaning Mop Equipment, you no longer have to hurt your hands, knees and back to mop your floors. This equipment contains an adjustable handle, a bucket and even a wringer that squeezes out the excess water for you, without you having to get your hands wet or dirty. A majority of the branded cleaning mops available in the market today are specially designed to make mopping a quick, simple and hassle-free experience for you. Though it is a simple piece of equipment, you have to consider certain factors to purchase the right one according to your requirements. We have mentioned them in our “BUYING GUIDE” for your reference. Apart from that, this article also contains a list of best floor cleaning mops picked up by our experts. They are carefully picked after a lot of research and testing. Foremost product in our list is Spotzero by the brand Milton – which is well-known in the market for manufacturing high quality products. If you’re looking out to buy an economical and good quality mop for cleaning your place, then this could be a good purchase. This multipurpose mop is both useful as well as environment friendly in nature. Its unique microfiber cleaning technology makes it highly durable and long-lasting. With superior water absorbency and non-abrasive lint free fibers, this Elite Spin Mop works well on large surface areas, for the purpose of dry and wet cleaning. An oval shaped bucket with drainage is provided along with the mop. It is light in weight, easy to use and carry around the house while cleaning. The extendable mop handle is equipped with separate cleaning and wringing operations. It also has a free 360 degrees’ movement in all directions. The side bucket handle is convenient to slide the bucket across the floors on wheels. The wheels are large and sturdy enough to move smoothly even on uneven surfaces. This mop can be used to clean dust, oil, liquids or even hair from the floors. Mop working mechanism needs some effort and pressure. The second product in our list is from a famous and one of India’s leading manufacturers of home cleaning since 1986. 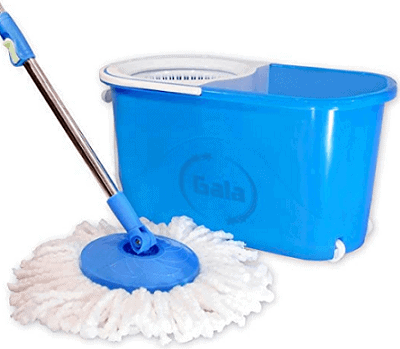 This Gala Spin Mop with Easy Wheels and Bucket comes with 2 microfiber refills with super absorbent capacity. The product has a warranty of 6 months on the rod part of the mop. The spin mop’s 360 degrees cleaning ensures it reaches difficult corners and under furniture easily without you needing to bend at all. A specially designed big spout shaped bucket with wheels comes with the mop, making it very convenient to pour out and dispose the dirty water after mopping. A strong and sturdy pull handle is attached to one side of the bucket. It can easily be used to pull the bucket on wheels around your house. There is no drain knob at the bottom, hence no hassles of water leakage from the bucket. The quick lock system on the handle of the mop is useful in cleaning of the mop itself. This spin mop works well with different types of flooring like tiles, slate, wooden or even linoleum. Its super spin system dries out the mop faster and it comes in a two-tone modern looking finish as well. Rinsing rotation mechanism not very durable with prolonged usage. Almost every one of us is aware of the brand – Prestige. Since many years, prestige has been manufacturing and marketing several cookware and kitchen equipment. Recently it has stepped into the cleaning solutions as well. Among their new product range, Clean Home Magic Mop is one of the best and durable ones. The 360 degrees spinning function ensures a thorough cleaning of all the floors and corners of your rooms. 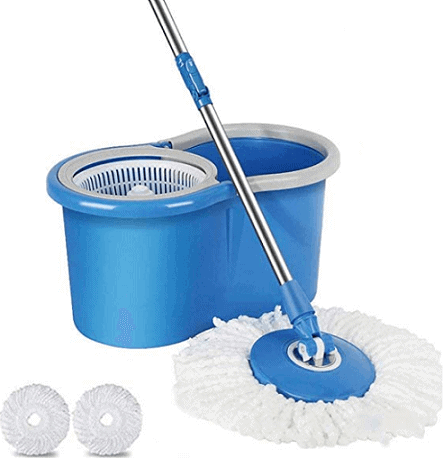 The mop comes along with a twin bucket made of lightweight but high grade durable plastic. It has a capacity of 7 liters. Two extra absorbent microfiber mop heads are provided as a part of the product. The handle of the mop consists of 2 steel rods that can be easily adjusted depending on your height. Aesthetically designed, this Prestige Mop is low on maintenance and long-lasting. Its unique inbuilt rinse has a solution dispenser function too to avoid wastage of water and soap. It is suitable for all types of floors ranging from marble, granite and mosaic to even tiles and wooden flooring. Manufacturer is providing 6 months of warranty from the date of purchase. Esquire is also one of the trusted cleaning mops in India which provide high quality products. If you want to keep away your hands from getting dirty and save your back away from backaches while mopping, then this product is the right choice. This product comes with two mop heads which are durable and long lasting. The high quality microfiber used has super absorbent properties which help clean all the troubled areas and even the hard to reach areas. The mop handle can be adjusted from 145 – 180 degrees to provide more comfortable cleaning. After unlocking the spin off, gently push the mop against the bucket to wring off the excess water. This self-wringing dries 5 time more effective than foot pedal spin mop. The bucket is very light in weight and sturdy so you can carry it to any other place in the home. The mop handle is made up of lightweight stainless steel. The mop heads are machine washable so you don’t have to worry about cleaning them. This product is perfect for both wet and dry cleaning. Plastic quality can be a little better. Scotch-Brite is a popular home cleaning solutions brand since more than 50 years. This Jumper Spin Mop comes with both round as well as flat heads to ensure easy cleaning of all flat surfaces in your home. Its unique single bucket design helps you to both clean/rinse and dry/wring the mop within the same bucket. A simple up and down motion of the mop inside the compact and lightweight bucket provided is all you need to do for easy drainage while cleaning the floors. This Scotch-Brite mop comes equipped with a unique superior microfiber refill-dirt trapping technology that does not spread dirt around like other mops. Its 360 degrees rotating head can bend in all directions, reaching under tables and sofas easily without you having to bend your back. An extremely simple refill removal system makes this a handy and hassle-free floor cleaning mop for everyday use. The flat head refill is meant to clean corners that are difficult to reach while the round head works well on normal floors. Squeezing out water mechanism could be better. Next from the list comes from a brand – HOLEM’s. Though most of us are not aware of this brand, this product has taken its place in our list because of its high quality material and durability. The mop head of this product is made up of plastic and micro fiber fabric. The micro fiber has super absorbing capability which makes it suitable for wet cleaning. The bucket is made up of super labor-saving industrial floor mops so it will last very long even if used regularly. The bucket has super spin system – where you have to place the mop and spin to make it dry. The length of the suitable is perfectly suitable for any person – you don’t have to bend your back while mopping. This product is available in different colors – you can choose any one as per your interest. Apart from that, the manufacturer also offers two free mop heads. And moreover free soup bowl set worth Rs. 240 is also shipped with the product. All these things make this product very reasonable. Last but not least from our list Huda Bucket Spin Mop. Unlike the other bucket mops, this one is shaped rectangular. And the mop handle can be locked by a twist unlike others which have a button for the same. The 360 degrees rotating magic mop is easy to assemble without using any tools and can be used both wet and dry. The hand driven mop has a double driver function and spin that makes the mop durable and reduces the issue of pedal breakage with longer usage. The adjustable stainless steel handle can be set to the height required depending on your comfort. The high quality super absorbent microfiber heads leave no streaks or spots on the floor and can absorb up to 8 times their weight in liquid. These are the most common types of cleaning mops. They come with a flat, elongated and rectangular head which make it easy to clean even small areas. They are further classified into dust mops (to gather dust and dirt from dry floors before wet mopping) and microfiber mops (that are highly absorbent and can be used both on dry as well as wet surfaces). In these, the cleaning heads are made of long loops of rags or cloth strips which are highly absorbent and work well in hard to reach corners. However, these types of mops are not very long lasting. Simple long looped cotton strings make up the cleaning heads in string mops. These are useful for cleaning large spills and can be easily washed after use. String mops are the most traditional types of mops and easily available. These can be of different types – cut end mops (cheap and short-lived), looped end mops (more durable, more absorbent) and microfiber mops (hypoallergenic, highly absorbent & long-lasting). These require electricity to function as the steam needs to be generated and released from the mop head onto the floor. Cleaning is by means of direct and moist heat; hence no cleaning solution is required for effective disinfecting of floors. How to Choose the Right Cleaning Mop? Even if it is a simple piece of cleaning equipment, you have to consider certain factors while purchasing it. We have mentioned them below for your reference. The greater the size of the mop head, the higher the mop’s absorbency and hence better cleaning. Also, it is advisable to opt for a long-lasting microfiber cleaning head that can be re-washed, re-used and is unlikely to cause allergic reactions as it is more hygienic than the others. If a very large area is to be cleaned regularly, a steam mop should be your choice. For everyday mopping at home, microfiber mops work best and for small spills every now and then, sponge mops should do the trick. Most of the floor cleaning mops available today come in a set along with extra refills, a bucket with built-in wheels and/or a handle to pull it along, a drainage outlet in the bucket so that you don’t need to touch the dirty water and so on. Depending on your requirements, you should choose the mop that works best for you and comes with useful accessories and features that make cleaning an easy task. How to Select Mop Type Based on Flooring? Not all mops are suitable for cleaning all types of floors. So, we have mentioned a list of floor types and suitable mop type for it. Wooden or Laminate flooring: If you have wooden floors, you need to ensure that they are cleaned with the least amount of water possible. The best way is to carry out dry vacuuming followed by a damp microfiber mop. Ceramic or Porcelain flooring: Ceramic or porcelain tiles can be easily cleaned using both a sponge mop as well as a microfiber mop. Concrete flooring: Gathering up the dust with a broom followed by steam mopping with no/very little cleaning solution works best on concrete. Stone flooring: Any type of mop works well on stone floors, with plain water or neutral pH cleansing solutions. Vinyl or Linoleum flooring: Microfiber mopping or steam mopping followed by a dry sponge mop to make sure the floor doesn’t remain sticky is the best way to clean vinyl or linoleum flooring. 1. How to clean a dirty mop head? First rinse the mop under the water until it runs clear. Then place the mop in a bucket containing hot water. Add a cup of bleach into it and let the mop soak for 10 minutes. Rinse again under water and let it hand dry. Instead of bleach, you can add a cup of vinegar. 2. Can I machine wash the mop head? If the mop head is removable then it can be machine washed. However, sponge mop heads are not recommended to machine wash. For machine washing a mop head, first add ½ cup of bleach to washing machine and run it on a normal cycle. Later hand the mop to dry it completely. 3. What are the steps to follow for disinfecting a mop head? Make sure to rinse the mop head after every use. As soon as you are done with cleaning, rinse the mop head under hot water. If possible, let the mop dry under the sun or at least in good ventilation. Avoid using bleach on sponge mops or synthetic mops as it will degrade the materials. Instead of it, you can use peroxide or vinegar solutions. Once the mopping is completed, empty the reservoir and wipe it down with damp cloth. Usually, a mop head lasts for 3 months. Depending on the usage, we recommend changing the mop head. 4. Why does my floor smell even after mopping? If the mop head is dirty and smelly then this could be the reason for the foul odor. If the mop head is not dried properly from the last use, then this can also lead to foul odor. If you are experiencing this, soak the mop in hot water, add bleach and soap into it. Instead of bleach, you can use vinegar as well. This way you can get rid of the smell. Even if this process is inefficient then it is time to replace the mop head. 5. How often should I replace the mop head? It is recommended to replace your mop head once in 3 months. However, it depends on how often you use the mop. If you use it more than once in a day, then it is better to replace it once in a month. The traditional way of mopping the floors requires hard work. With our busy schedules, it is difficult to spare so much time and work. So, cleaning mop bucket make this tiresome process a lot easy. With them you no longer have to bend you backs and worry about wringing out the water with hands. After researching several choices available in the market, we have sorted out a list according their efficiency. Out 7 picked out products, Spotzero Milton Cleaning Mop has taken the top position. If you have a closer look at its features and efficiency, you will surely agree with our decision. However as everyone has different ingredients, you can research on your own as well. Our buying guide can be of a great help for the same. Lastly, if you have any queries or doubts, write to us in the comment section below. For further such articles, stay tuned with our website.